Every year, agencies like CBS, OSHA and EPA investigate the biggest accidents that occur in the oil, gas and downstream sector, searching for root causes. There never seems to be one reason or mistake, often a combination of multiple factors lead to such catastrophic events. A lack of training, bad communication, wrong design and product malfunction are a few examples that are frequently identified during the root cause analysis. In most cases though, the human factor plays a vital role. Often preventive measures are suggested to reduce human error. But one could argue whether sole reliance on training, enhancing procedures and increasing awareness is sufficient to prevent potentially lethal and costly human mistakes. The simple answer is that reducing the impact of the human factor is possible by taking appropriate preventive measures such as training, procedures and improving the overall safety culture. But still failures during isolation and reinstatement of process plants are one of the main causes of loss-of-containment incidents that lead to major accidents. 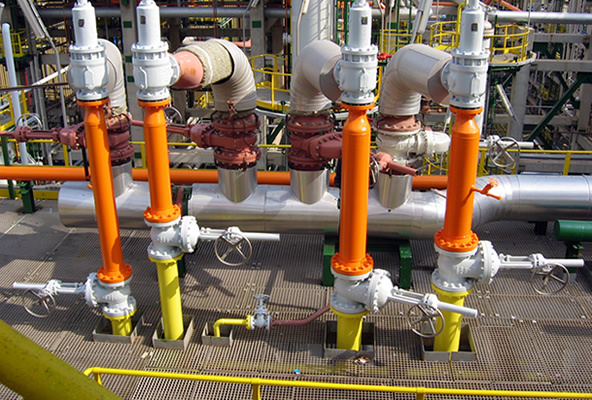 Many industry examples of accidents show that implementing simple means like mechanical interlocks can reduce the risks associated with valve operation. In one example, a filter cage was being removed for cleaning from a horizontal inline filter. The filter was isolated on each side, after which the front of the unit was opened to remove the filter cage. As a partial blockage prevented the upstream gate valve from fully closing, a significant quantity of highly flammable liquid was released through the opened filter box door. In this example, the operator would not have been able to proceed in the valve operating sequence if valve interlocks would had been installed. Interlock keys can only be released when a valve is fully open or closed, so the blocked upstream valve would have been identified as a problem, not being able to be fully closed. In another example, during replacement of a heat exchanger, a vent line linking the system to a second reactor was not identified. No reference had been made to P&IDs, even though the plant was congested and spread over several floors. Because of the failure to isolate the vent line, a substantial release of hydrogen bromide gas occurred when the line was opened. An interlock sequence is determined during plant design and includes all valves that could potentially lead to hydrocarbon outbreaks. An interlock sequence prevents these valves from being missed or overlooked in the field. Implementation of mechanical interlocks should be based on best practice. Only thosen valves which are deemed critical in causing an accident should be interlocked, based on HAZOP or other risk analysis results. Commonly, interlocking sequences consisting of only two to four valves suffice to make a process safe. The implementation of interlocks does not impact plant operation in general, but drastically increase operator safety. Various international oil & gas companies acknowledge the value of mechanical interlocks. Not only have they incorporated strict procedures in their engineering practices, reference documents and project guidelines, but they have added the use of mechanical interlocks to their common process safety precautions. Thus they enforce strict adherence to procedures on critical operations, such as start-ups and shut-downs, isolations, relief valve change overs and pigging operations. A broader awareness of the enormous possibilities of the application of interlocks will contribute to the prevention of future incidents. For this reason Netherlocks published a sequence book, showing best practices of interlock applications by worldwide industry leaders. With the sequence book Netherlocks shares more than 35 mechanical interlock applications that are already adopted globally to prevent failures during isolation and reinstatement of process plants.